Saturday 13 October – It’s YOUR party! Everyone is invited to join us on Saturday 13 October for our It’s YOUR Party event. The Centre will be decorated with balloons and colourful square bunting. With the announcement of the cash prize winners most definitely being a highlight. But the event The Square is most excited about will be the honouring our Heroes ceremony that will take place from 9am. The Square is about the community and this is what the day will be about. A major part of the events taking place will be the “Honouring our HEROS” ceremony. We have invited pre-primary schools to choose and honour an organisation that they deem to be Heroes. 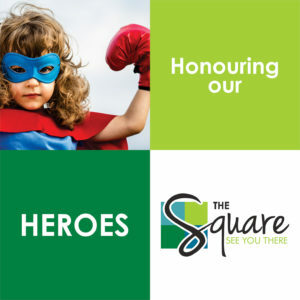 Pupils of Elizabeth Montessori, Chirpy Baby and Toddler Centre, Nellie Miere and Mosaik are hard at work making special thank you cards, to honour their heroes. On this day the Square will donate R10 000 to each of these establishments as well. The Establishments that were nominated are Cansa, Bossies Community Justice, SANCA and Nelspruit SPCA. The day will be filled with activities such as a demonstration by the Nelspruit Gymnastics Academy and performances by the Kamagugu School’s marimba band. There will be a jumping castle and loads of give-aways. Most certainly a day to add to your calendar. PLUS Shoppers that spend R250 or more on this day will also receive a very good looking The Square branded shopping bag.